Guess what, Snarklings? It’s time for the long-promised review of Spin Doctor Clothing! Yes, really; the Lady of the Manners has been meaning to write up this review for over a year now, but agents of chaos kept thwarting that plan. Anyway! I first discovered Spin Doctor around a year and a half ago, when I was indulging in one of my periodic insomnia-fueled searches of “Gothic Victorian” on eBay. I kept finding items that were utterly charming, with the sort of dark Victorian-but-not-entirely-historically-accurate flair that I prefer in clothing; skirts, waistcoats, jackets, and blouses all made by a company I’d not yet run across. A few days later, after I’d caught up on my sleep, I decided to look at those items again and see if I still was charmed by them, or if it was another case of magpie-brain caused by sleep deprivation. No, it wasn’t. The items from Spin Doctor were just as enticing as I had remembered. 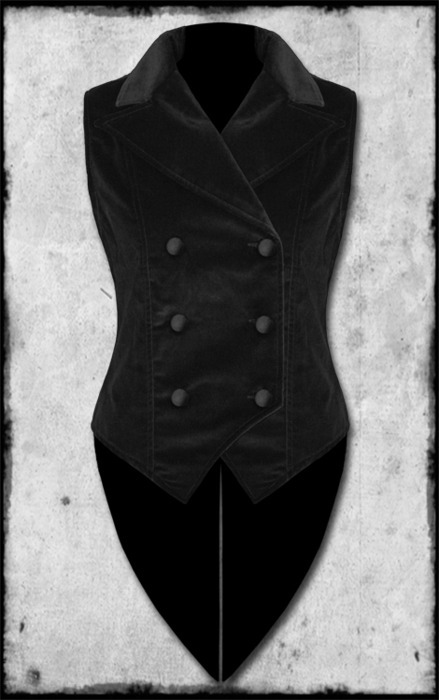 So enticing, in fact, I gave in to temptation and bought myself the “Harriet” waistcoat. When it arrived in the mail, I was delighted. Black cotton velveteen, double-breasted, corset lacing in the back to adjust the fit, and it had a swallowtail back? I decided I had to know more about this company. Specializing in Steampunk, hmm? Well, I’ve been saying for years that the Steampunk folks have been rummaging around the closets of the Gothic Victorians, so I suppose it’s only fair that we do the same thing. After doing a bit more searching around, I discovered that Spin Doctor is one of the brands produced by alternative clothing company Pop Soda, who are also responsible for HellBunny. 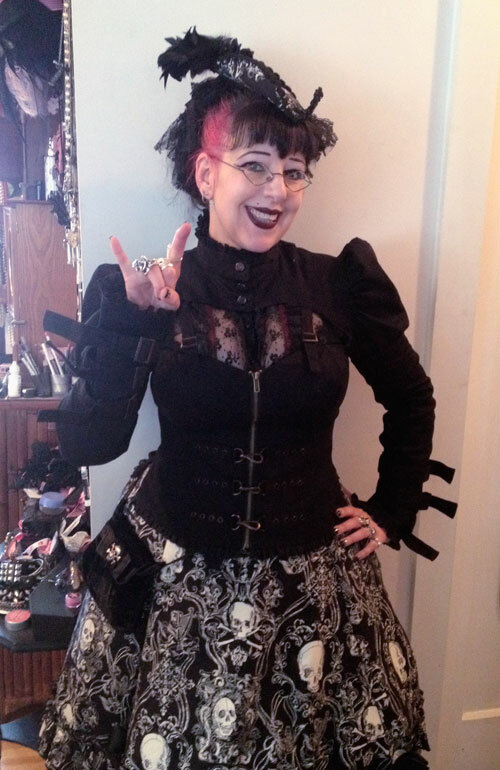 I contacted them, and was delighted when they very kindly sent me a skirt and jacket to review! 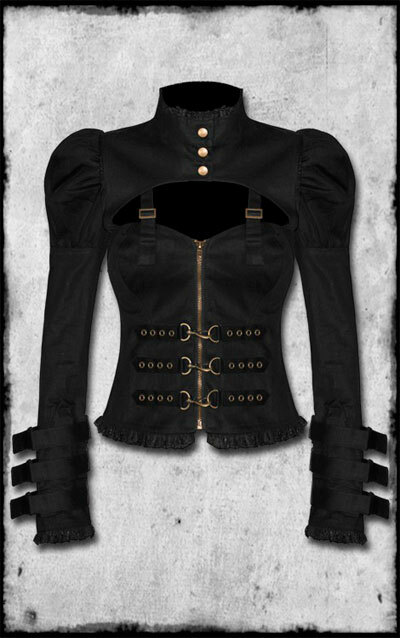 The second item that the nice folks at Spin Doctor sent me was the “Steampunk Open Cleavage” jacket. Oh my, rather racy, isn’t it? ::wink:: But that’s part of the fun of it, because it can be worn alone as the top part of an outfit if you’re feeling saucy, or you can wear it over a blouse, as I did when I wore the jacket to Steamcon III. 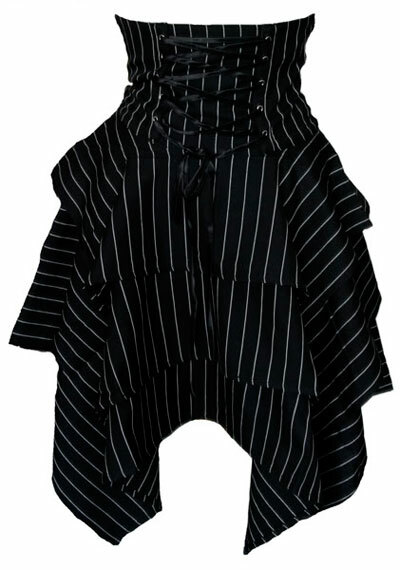 It’s made from a heavy-weight polished cotton sateen that has a tiny bit of stretch to it, has the corset lacing in the back (again, but that’s just fine, as I’m very much in favor of garments having that detail), and the buckles and clasps are all sturdily attached. The puffed sleeves and high collar give it a quasi-Victorian air, while the daring cleavage window keeps it from being too staid. My only complaints about Spin Doctor? Well, there’s the usual one of they don’t seem to offer any sizes larger a women’s XL/14, alas. Which is a shame, because the designs they’ve come up with would look fantastic on larger ladies, too! They also don’t seem to have anything for the menfolk, even if their company info states they will produce menswear. My final quibble with them is that most of the retailers I’ve found that carry their wares are in the UK. This makes sense, as Spin Doctor/Pop Soda are a UK -based company, but it means postage costs can be a little steep for non-UK customers. I know that in the Seattle area, BedlamBedlam and The Metro both carry Spin Doctor; for folks in other cities, check with your local independent alternative fashion retailer and see if they do, too! 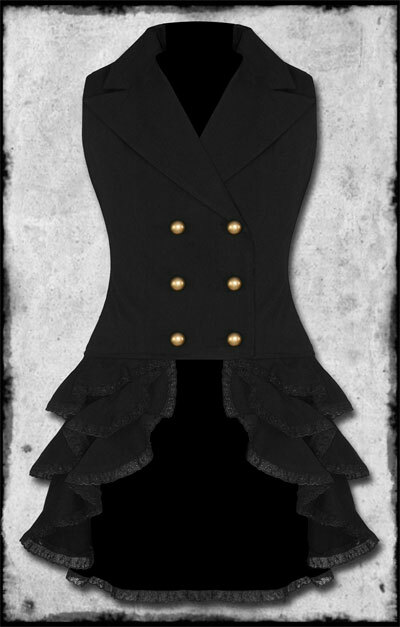 Because if you’re looking for darkly elegant clothes with a neo-Victorian twist, you really want to take a look at what Spin Doctor has to offer!